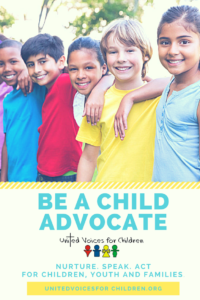 When I think of the role that United Voices for Children can play in our society and to those of us associated with this organization as child advocates, I believe we are here to focus on those values that can help children realize their potential as they grow toward adulthood. Hopefully, this focus should be experienced at all levels of life in our communities– personal, family, and neighborhoods, as well as through the broader governmental entities that shape our communities and personal lives. As a prison chaplain in an all-male institution, I found the most meaningful experiences in my ministry to these young offenders were the group meetings I held during the week. In these group meetings, I would invite 6-8 of these juvenile offenders to come to my office where we would have frank discussions on what they could do to change their behaviors when released from the institution. In one meeting I remember we were discussing the commandment, “Honor your father and mother.” I asked the group, “How would you describe a good father?” One young man said, “A good father is one that would take me to a Sox ball game and buy me a beer.” Some talked about the fact that they never knew their father, but the person they respected most was the guy down the street with good looking clothes standing by his brand-new Cadillac that he had just stolen. Because these young men lived on the streets in such a “raw” environment, it was hard for them to understand the meaning of love and respect for their families, their neighborhoods, or even respect for themselves. This is why when one of these young men was ready for parole, I would try to find the neighborhood where he would be living after leaving the institution. I would then contact a pastor from that neighborhood (quite often United Methodist) and ask that person to get to know the young man being paroled and to help him prepare for a job, or pursue educational opportunities that would take him away from continued criminal activities. This is why the work of child advocacy can be so relevant when it focuses its efforts toward motivating communities, churches, schools, legislators, and businesses in our neighborhoods to develop programs that support these young men (and young women parolees) in their attempts to live productive lives. Congregations in our communities can encourage businesses to find ways to train and hire these parolees, so they can gain money through their employment rather than by stealing. Pastors and church members through mentoring these young men and women can help them to function more positively in their relationships with others. Those of us associated with United Voices for Children have two important challenges–(1) motivating church folk to take to the streets to work with vulnerable youth and children, inviting them into the warmth of your congregations, and (2) working with your legislators and community leaders to see that resources become available through prevention-oriented programs that will motivate these youth in becoming upstanding men and women in their communities. The Rev. Mason Scholl is a Lifetime Honorary Board Member of United Voices for Children & a retired institutional chaplain. UVC board members & affiliated agencies offer resources and reflections on ministries with children, youth and families. Who is my neighbor? Easy answer.